Piers Linney was born in February 1971. His father was English and his mother was from Saint Phillip in Barbados. Linney started his first job when he was 14 years old. He worked as a paperboy for various newsagents. Later on he started to buy and sell newspapers directly from the suppliers. 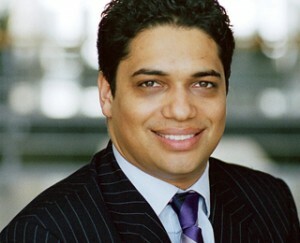 Today, Piers Linney is a successful British businessman and the co-CEO of IT business Outsoucery. He also appears as a dragon on the popular television serious Dragon’s Den on BBC. In 2011, he appeared in the series “The Secret Millionaire” where he worked at a Young Offenders’ institution. Piers is married to Tara and they have two children, Electra and Tiger. Piers has English and Barbadian heritage and he grew up in a small town in Lancashire. After he failed in his 11+ he studied in his local comprehensive school. At the age of thirteen, he had thought of becoming his own boss. After delivering newspapers from home to home, he started selling household products. He dreamed of success from a young age and while he wanted to get into business, he also wanted to further his education. He had thought of a career in law and finance. He studied Accounting and Law and in 1997, he became a qualified solicitor. This gave him the opportunity to work with SJ Berwin. At this renowned city law firm, Piers specialized in corporate finance and venture capital. But be also remained involved in various entrepreneurial ventures in film, media and business services. He became an investment banker following his qualification and worked at Barclays de Zoete Wedd and Credit Suisse. His experience and skills attained by working in London opened doors to more opportunities and successes. Piers had accumulated a thorough knowledge and understanding of venture capital law, corporate finance and corporate law. When he realised that he cannot fulfil his career desires in the City, he left the City and started his own internet enterprise. Since then, he has been involved in various businesses and sectors through direct investments as well as funds from research. His success lies in the fact that he is a success-driven man. He is goal-oriented and with his skills, talent and knowledge of both financial and technical aspects of a businesses, he is able to implement new ideas and attain success. He is passionate about helping people who are looking to achieve success. He enjoys sharing his experience and knowledge with the rest of the world.